We got a harsh reminder last round that depth is vital so I have named up a couple of conservative selections that won’t cost you the farm… or your playing bench cover. Discuss your plans in the comments. It certainly wasn’t the way we expected to celebrate the end of the byes with big names dropping like flies on Thursday, Friday, oh and Saturday and Sunday! But either way, it was certainly good to have a full list of teams playing, even at the expense of one trade per week. Dan Butler- Should have been done weeks about, no ability to score. Toby Nankervis – Another tough match up this week, thanks and goodbye. Jake Barrett– Had a shocker, but still worth enough to be part of a significant upgrade. Tom Stewart – Unfortunately injured after really finding his feet lately. Caleb Marchbank– Contender for ROY, but plenty of value in the backs to upgrade to. Sean Darcy (RUC, $199,000) BE: 45 – 40 hit outs and an impressive 80. Alex Witherden (DEF/MID, $225,000) BE: 14 – Looked the best of the Lions kids and got open for plenty of marks. Sam Docherty (DEF, $713,000) So far out of reach for non owners it is ridiculous, but he still needs to be mentioned because he is probably the most important player to own, given he is a defender and has the scoring of an elite premium. He has a five round average of 133 and a three game average of 139 which is nuts. If you can somehow get him without ruining your team by selling the farm, do it. Steele Sidebottom (MID, $642,000) is officially on fire! He has a five round average of 126 which would have to indicate career best form and the crime here is that only 2% of the competition are enjoying it. He has a great run coming up with games against the Hawks, Bombers, Suns and Eagles where he should continue to rack up. Robbie Gray (FWD, $430,000) is once again great value for a bloke called Robbie Gray! He has finally put a couple of nice games together with scores of 117 and 99 ahead of a game at home against the Tigers. I certainly don’t think this is an indication that he is a shadow of what he has been in the past as he is relying on goals to score but for this price, he is still a good pick. Bernie Vince (DEF/MID, $408,000) has had a shocking season by his standards, averaging just 77 and dropping $146,000 from his opening price. In the absence of Nathan Jones last week (I might be grasping at straws there) he had his second 100 and highest score of the year with 113 from 27 touches, eight marks and five tackles. He has a break-even of just 56. Sam Menegola (FWD/MID, $523,000) Apart from a blemish in round 13 with 65, Menegola has a low score of 86 for the year while scoring as high as 124 and 133. He scored 124 last week with an awesome game including 22 touches, eight marks, nine tackle and a goal. With Joel Selwood questionable this week, he might need to step up again. Kobe Stevens (FWD/MID, $517,000) is coming off a great score of 115 where his tackling pressure was phenomenal. He has a five round average of 91 but what I like most is his ability to hit triple figures, doing so in four out of his seven games. Isaac Heeney (FWD/MID, $550,000) is someone I seen to talk about every week, but given he is only owned by 28% of the competition, it seems I need to keep talking about it. The kid is an absolute superstar with a three round average of 115 and a break even of 75. I’m gonna trade Nank to Gawn. Do I do it this week as Gawn will most likely out point Nank OR next week as both will lose money (hopefully Gawn more than Nank) and therefore make a savings on the trade? Wait. Gawn will fall more than Nank over next fortnight. I want to get rid of Nank, but getting rid of Barrett for Trelaor is a bigger priority. I currently have Nank in the forwards so some juggling next week will be required. It won’t matter, Nank will still lose cash, and if you do the maths it’ll only save you around 10k. If you trade him to Gawn now, you’ll get more points. Nank should be good for about 60… Gawn could go 110+. So if you’d rather give up points than dosh, then wait. Otherwise pull the trigger amigo! Don’t do it this week! BE is like 150 for Gawny and he’s sore. Wait one more week, and if you can’t, trade out Nank to the forward line and grab someone cheap. 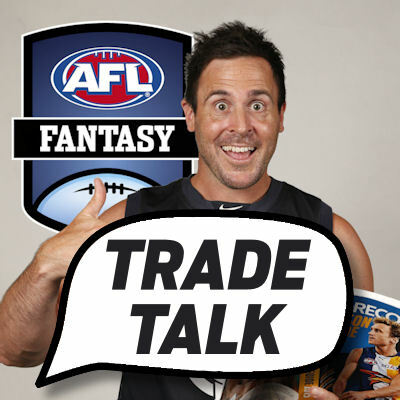 Trade stable money injured Beams & Stewart or trade losing money players Nank & Barrett? Leaving Beams on the bench equals leaving a lot of coin on the bench. Trade injured premo’s, injured rooks not so much. Is noone else worried that Menegola’s scores have been a touch lower since Scooter stole his centre stoppage time? Big score this week only because J Selwood on the pine. Im thinking hes a 90-95, not a 95-100 player for the remainder. I guess the obvious answer here is to make sure you get the best side possible. Figure out whether Witherden is someone that’ll be a good stepping stone. Otherwise, Menegola is worth getting in and upgrading to an uber-premium in 4 weeks’ time. Both top 6 most likely – Yeo is best in class. Pending Ablett being back this week. He’s still in doubt mate! Jeppa’s never coming back, is he…? I expect Newton’s 3rd Law will resolve the situation. With apologies for any stretching in the analogy, complete attention to the junior at home will at some point reach a point of tension that will have Jeppa’s attention bounce back to the juniors on the hallowed turf once again . . .
. . . out of necessity. Hope you’re right because if he doesn’t come back I’ll be led to think there’s something wrong with the vibes I’m sending. I hope he doesn’t take them the wrong way… that handsome devil! I need a bit of help with two trades this week. I have 53 k in the bank .
. . . in my team I have Heeney! Walters, Gray or Vince? I feel like vince won’t score as well as the other 2 and Walters is probably a bit risky, so leaning towards gray. You could get a better price rise from Vince and Gray (than Walters) if they steady the ship with their scores. Vince probably has the benefit of having more midfield time over the next month with Jones out (arguably the main reason for his ton score last week). You would expect him to score better over that time given an adjusted role. Robby Gray seems to have his mojo back, but with his score relying on sausage rolls conjured while on forward duty, there is a caveat on ‘ton’ scores. I happily have Gray (from a trade a month ago) but not Vince, but if I had neither I think that in looking to the next four weeks, I would favour Vince who, as the mouse (up to this point in the season), has the advantage of being able to play while the cat is away. As for Walters, he doesn’t seem to quite provide the same opportunities. Who is the best forward to get for $490k or less?? Anyone else have any opinions ? I prefer Papley and Elliott (if back in) over both of those. Hit good scores and are cheaper. Robbie Gray, yes, but don’t expect reliability in his high scores unless he gets more points from midfield time in proportion to sausage rolls from forward time. Boak, due to his last 5 average of 76, probably, no. Do you have exactly 490k available? If you had 492k you could consider Dahlhaus? Or, on the budget side, if Elliot is available this week, you might look at him @435k, last 5 average of 91 and a BE of 52. Docherty, Daylight, Adams, Daylight, umm… Laird / Roberton / Lloyd / Montagna / Houli / Newnes. Probably Roberton, Lloyd, Laird and Newnes as final 4. But many will be similar scorers, Doch/Adams are really the only ones who pump out the occasional 130+ score and are potential captainable. Have some important league matchups starting next week (easy win this week) – not much cash and need to get rid of underperformers… How is this trade for a hail mary? Hail Mary’s are difficult to reasonably comment on. But the trades are not completely in that category, I think. Offloading Heppell and McGrath for those two is a clear gain, imo. The Hail Mary is from just the unexpected selection (from giving priority to PODs), not so much from throwing all your chips prayerfully into the air! Do that and at some point in the future you’ll want to come back and kick current HeathShawsShankedRedemption in the nuts… sort of like most of us want to do with current HeathShaw. I know little of HeathShawsShankedRedemption’s posting history, but I held off from grabbing Heath Shaw’s nuts . . . though nothing to do with homophobia. If I were in possession of them, however, I would have a beer in hand and be listening to Tchaikovsky’s Opus 71a, which is relevantly and well named colloquially (the ‘Nutcracker’ Suite or was it ‘sweet’), and preparing for the finale. Your name’s almost as awesome as your beard… damn that’s impressive! Just depends what you’re looking for really. Riewoldt 70-110 and may get injured. Easily the most up and down, but the only one who could challenge Yeo IMO. Ross should be blushing that he’s even part of the conversation. 3 is nice as it gets you two premium defenders. If you think Tuohy will be top 6-10 defender then definitely 3. Otherwise go option 2 and use the $$ to get those top players. Gents, after some pearls of wisdom. Only rooks i have on field at this stage are greenwood witherden and newman. 1 trade left. Cash grab for a rook…. I don’t think it’s possible to help someone who’s top 3 trade out priorities are 3 guys I’d consider keepers… you’re clearly playing this at a higher level than me. I don’t ask 3-year-olds in the sandpit what kind of nail gun I should buy! Can you do anything else down back to get Witherden on your bench? I’d be nervous fielding him. Maybe DPPing Sloane is the answer if he’s the worst-performing MID you’ve got. Average-wise, Sloane’s 17th highest this year so he’s pulling his weight (depending on what you bought him for… hopefully not $720k!). Dahl’s a hold for me despite his run of dodgy scores. He did the same thing at the start of the year and then got a run of great scores. For his price, you’ll hardly do better. I don’t really understand your question but I will say is I wouldn’t touch Ross. His scores are okay, but so are 50 other guys who are cheaper. Good idea to get rid of Clayton Oliver for any Midfielder? I’m backing Clayton to fire up following his little moment. With Gawn jamming the ball down his throat. He will raise his average. On a different subject. A little off topic. The AFL have appealed Houli’s 2 week suspension. I say if they fail in their appeal, they should have to eat humble pie. For 2 weeks instead of 1, and incur a 75pt carry over. Whats with all the hype about Witherden as a rookie? I haven’t seen him play so genuinely asking. Will johannisen become fantasy relevant again. Few tags few low scores. Low price. Ave 95 last year…. If Ablett is out this week, whorls trading hin to Grundy be suitable. I could then go Nankervis to Newnes. It seems that Ablett will play. Selwood (J) is the one who will probably miss. Best option from S.Menegola, J.Lloyd, N.Riewoldt?? All around the same price, all around the same average.. Riewoldt can go HUGE, Lloyd is SUPER consistent and Menegola is almost elite WHEN he gets midfield time.. Boys, thoughts on best 2 POD’s (under 10% ownership) in each position except ruck? Need help with trades this week. Have 120k in the bank! I have 3 injured players, Taranto, Picken, Lynch. I could still field a full team even with them in my side so should I use the 300K in the bank on upgrading 2 of 3 or should I upgrade 1 and trade out Nankervis per the suggestion above. And out of the 3 which ones should I upgrade? In – Sidebottom and Vince with $2K for next week. In – T Mitchell and Witherden with $100K for next week.